Arsenal have done a decent job with their bogey teams this season. They've beaten Swansea twice for the first time since their 2011 promotion to the top flight. They beat Chelsea by three at the Emirates. They handled Southampton with aplomb on Saturday at St. Mary's, a stadium in which Arsenal had not won since 2003, to set up a tasty fifth round tie with non-league Sutton United (**insert magic of the cup cliché here**). They'll get another crack at Chelsea this coming Saturday, with their title hopes possibly in the balance. But before then, Arsenal need to win at home against Watford tonight. The Hornets have been struggling lately; they haven't won in the league in a month and a half. But just because a club is struggling doesn't mean they won't give Arsenal a fight. The Gunners have, in recent games, left it late to get wins against the likes of West Brom, Preston, and Burnley, while they spotted Bournemouth a three-goal advantage before storming back to rescue a point. No games in the Premier League are easy and Chelsea probably aren't relishing traveling to Anfield tonight to play a Liverpool squad desperate to remember how to win. Arsenal's deficit in the table to the Blues right now is eight. It could be anywhere from five to 11 by the end of tonight. It could be anywhere from two to 14 by Sunday. So, yeah. Big week, this. Rotation is one thing, especially for a cup tie ahead of a league fixture three days later, but when the likes of Aaron Ramsey, Olivier Giroud, Mesut Özil, and Francis Coquelin all failed to make the bench at all, some alarm bells went off. Thankfully, those alarms were unfounded; all four are available for selection tonight. Meanwhile, Arsenal got a number of players back from injury, as Per Mertesacker made the bench and Theo Walcott, making his first appearance since Christmas, picked up a hat trick. There's bad news regarding Mohamed Elneny, who is on international duty with Egypt, and missed the Pharaohs' quarterfinal match against Morocco with a calf injury picked up in training. Egypt won 1-0 and will face Burkina Faso in the semifinal tomorrow. Predicted XI: Čech, Bellerín, Mustafi, Koscielny, Monreal, Coquelin, Ramsey, Alexis, Walcott, Özil, Giroud. Defender José Holebas will serve the second match of his two match ban for accumulating 10 yellow cards. Watford will also be without Valon Behrami with a hamstring injury and Roberto Pereyra, who scored in the reverse fixture, with a knee problem. Nordin Amrabat is a likely absentee as well with an ankle injury. In the doubts category, Odion Ighalo is very likely on his way to China in a transfer, as he's fallen out of favor with manager Walter Mazzarri. Meanwhile, exceedingly tall backup goalkeeper Costel Pantilimon is a doubt with an ankle injury, Isaac Success is a doubt with a hamstring injury, and Christian Kabasele is a doubt with a cramp. Predicted XI: Gomes, Kaboul, Prödl, Britos, Zuñiga, Mason, Capoue, Watson, Cleverley, Okaka, Deeney. In recent weeks, Arsenal have won with surprisingly aplomb on the road in places they usually struggle, winning 4-0 at Swansea and 5-0 at Southampton. Of course, they've also made difficult work of Bournemouth, Preston, and Burnley in the process as well. Still, the Gunners are unbeaten in seven across all competitions (after they had lost three of six) and have won four straight for the first time since October. Meanwhile, Watford are trending in the other direction; the Hornets have won once in their last nine across all competitions, and that was an FA Cup tie against Burton Albion, who are 20th in the Championship. They were then knocked out of the cup on Sunday by a Millwall side who are 10th in League One. They're winless in the league since beating Everton on December 10 (days before the Toffees beat Arsenal, but that match was in Watford and not Liverpool.) The Hornets have fallen to 14th in the Premier League table, eight points clear of relegation. Arsenal won the reverse fixture at Vicarage Road, 3-1 in late August. Arsenal took the lead from a Santi Cazorla penalty within the first two minutes, then scored twice within six minutes, through Alexis Sánchez and Mesut Özil, to lead 3-0 at halftime. Roberto Pereyra scored for Watford in his first match for the club on 57 minutes to make things briefly interesting, but it was the only goal the Hornets could pull back. Last March, both sides faced off in the FA Cup sixth round. Arsenal had 71% of the possession and 20 total shots, but they only managed to get four of those on target. Odion Ighalo and Adlène Guedioura scored in the 50th and 63rd minutes, respectively, to give the visitors a 2-0 lead. Danny Welbeck came off the bench to pull a goal back in the 88th, but agonizingly missed the net on a sitter just minutes later when the chance to dramatically force a replay fell to his feet. 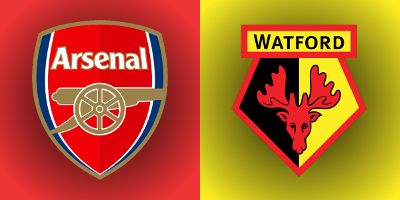 Overall, Arsenal have a mixed-to-mediocre record against Watford; in their 19 league encounters, Arsenal have won 10 of them and Watford have won eight, with one draw. Of course, those were almost all in the 1980's, leaving them not particularly relevant to this fixture anymore. The referee is West Midlands-based Andre Marriner. Arsenal have lost only one of their eight matches with Marriner since that thing he did that time, winning five straight over Southampton, Everton, Newcastle, Tottenham, and Manchester City. After that, they had Marriner for their FA Cup loss to Watford last season, their come-from-behind 1-1 draw at Old Trafford back in November, and their 2-0 win over Crystal Palace at the start of this month. I'm sure you noticed in there that Arsenal's only loss in that eight match stretch with Marriner was against Watford at the Emirates. In 12 matches all-time with Andre Marriner in the middle, Watford have only lost once, a 3-2 loss to Coventry in the Championship in 2009. The Hornets have won six and drawn five with Marriner in the middle aside from that loss. This will be the first time Watford see him this season. Arsenal have a record of 19 wins, three draws, and six losses in 28 total matches with Marriner. John Painting is a contributing writer to the Modern Gooner and a ghost town in Montana. You can follow him on Twitter @zorrocat for BOO! !